Top o’ the mornin’ to ya! Or afternoon, evening, or middle of the night depending on when you’re reading this. To celebrate one of the greenest and liveliest holidays of the year, St. Patrick’s Day, we’ve found all things green—from sweets to crafts to décor. If you little leprechauns are looking for a way to celebrate March 17, here are some ideas for you. You don’t have to follow a rainbow to a pot of gold to get this lucky look. 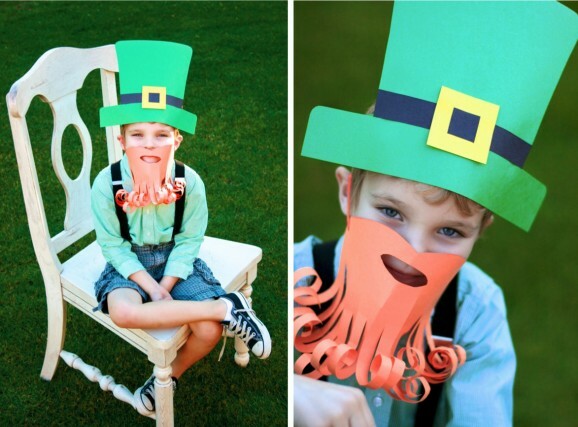 Get your wee ones a fun costume to wear on St. Patty’s Day, to a parade, or to a party planned this month when you try this leprechaun costume. All you’ll need is construction paper, scissors, glue, tape, and some creativity. You can break this costume back out on Halloween too if you need to throw something together quickly. It’ll make your kids break into a happy jig when you’re done and they get to put it on. 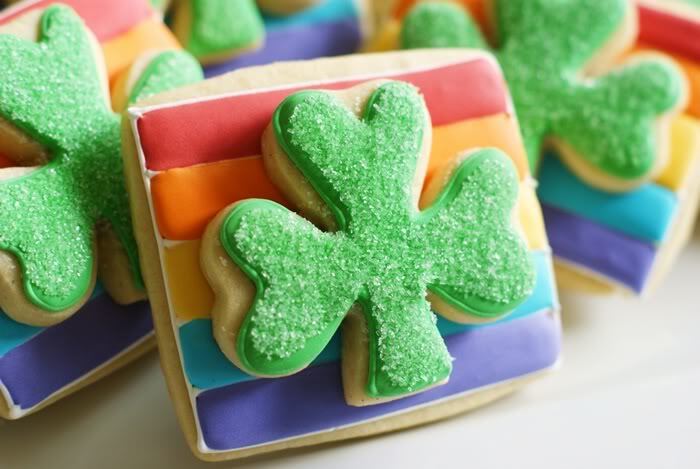 Four leaf clovers and rainbows are so ingrained in St. Patrick’s Day that we couldn’t pass up these delightful cookies. Celebrate the heritage of the Emerald Isle when you bake up some of these colorful confections. You could always simplify the recipe by keeping the shamrocks and rainbows separate. Or, you could do as this baker did and sandwich the two for a jolly looking cookie. Have your kids bring these in for a March bake sale, bring some into the office to spoil your co-workers, or make some for eating at the house just because. Wreaths are a quick and easy way to show your holiday spirit. This particular craft brings out the spirit of St. Patrick’s Day and then some. 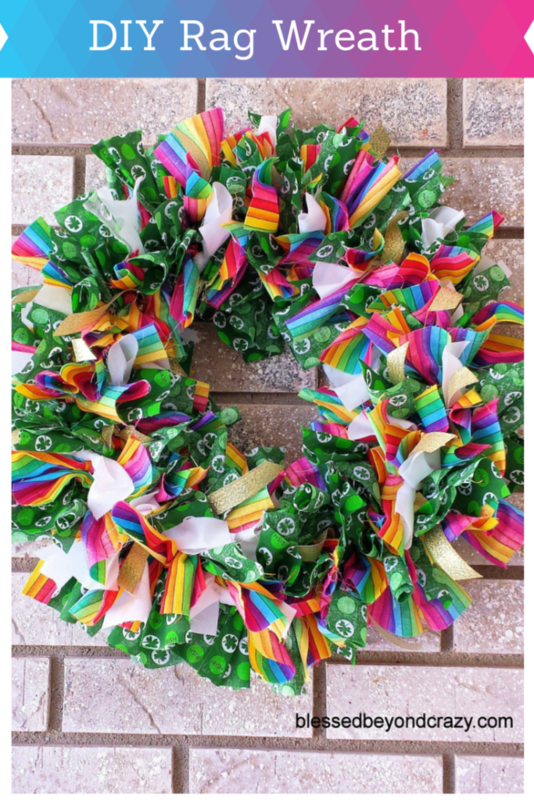 With strips of fabric in green, four leaf clover print, and rainbow, you can weave this together in little time and hang it on your front door for the week of St. Patty’s or the whole month if you have strong Irish pride. It’s something that you can do on your own or have your kids help with on a free weekend afternoon. Leprechauns and pots of gold go hand-in-hand. They’re also something that pops into everyone’s brains when St. Patrick’s Day rolls around. 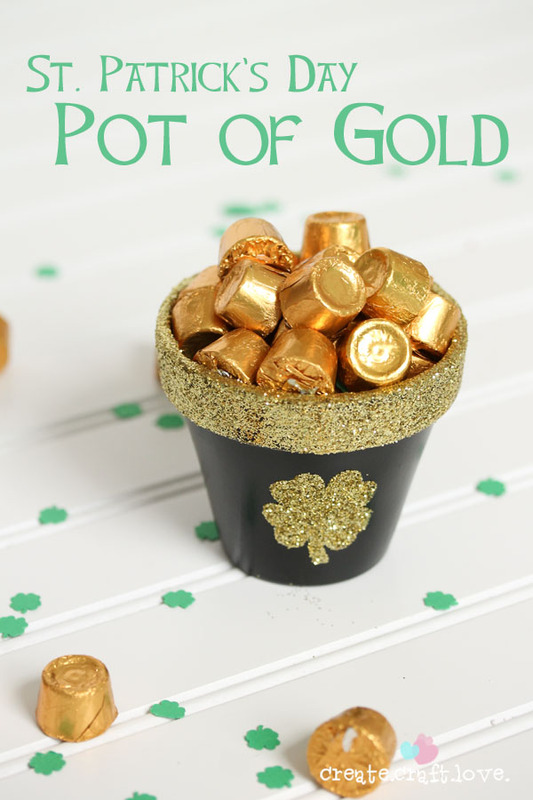 These pots of gold won’t only make you rich, but will fill your bellies as well. Using Rolo candies (or any round candy with a gold foil wrapper) and mini planters painted to look like cauldrons, you’ll have yourself a festive holiday treat, decoration, or party favor. Set these out on the dinner table on St. Patrick’s Day after everyone’s eaten their Irish stew and soda bread or bring them into the work place to share with friends. St. Patrick’s Day is full of delicious beer, celebration, and vibrant colors of the rainbow. 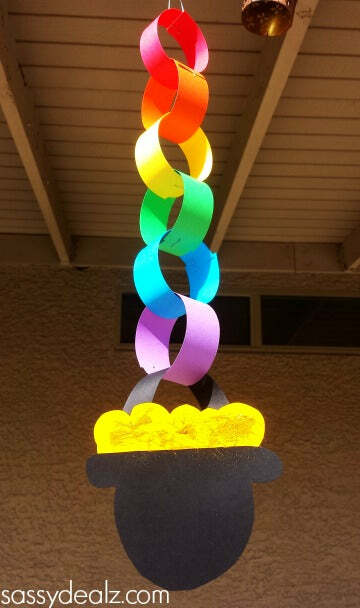 If you’re hosting a party and need to decorate to add to the enchantment, make this easy ceiling garland. You can use construction paper or card stock in the colors of the rainbow, staples or tape, and some scissors to make this craft come to life. If you’re a teacher, this is also a fun craft to share with students and to make to decorate your classroom. Green is undoubtedly the color of Ireland. It’s on their flag, gleaming from their dewy pastures, and present in leprechaun garb. 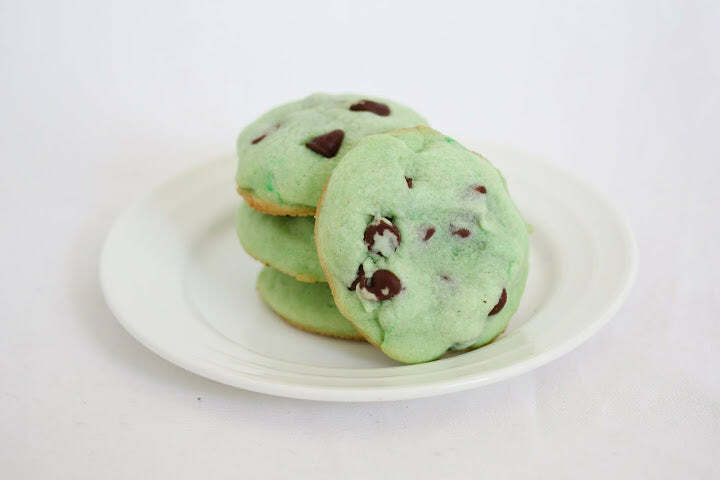 These green chocolate chip cookies are an extremely easy way to add some St. Patrick’s Day pep into a baked good without having to try too hard. Minimal added effort here, people! 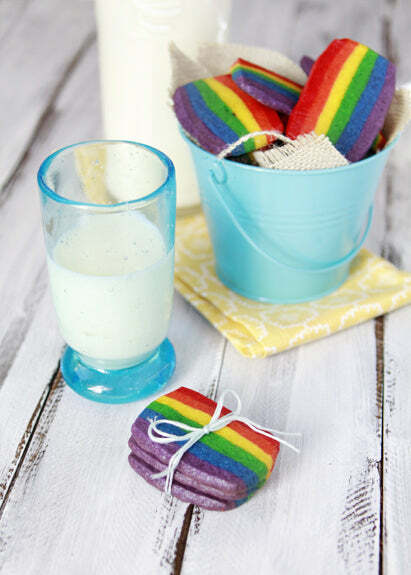 :) You can follow the recipe below or use your favorite and then add a few drops of green food coloring to the mix. Serve with green dyed milk and you’ll have an emerald feast fit for celebrating Irish culture. Don’t spend hours searching for a four leaf clover in your back yard. 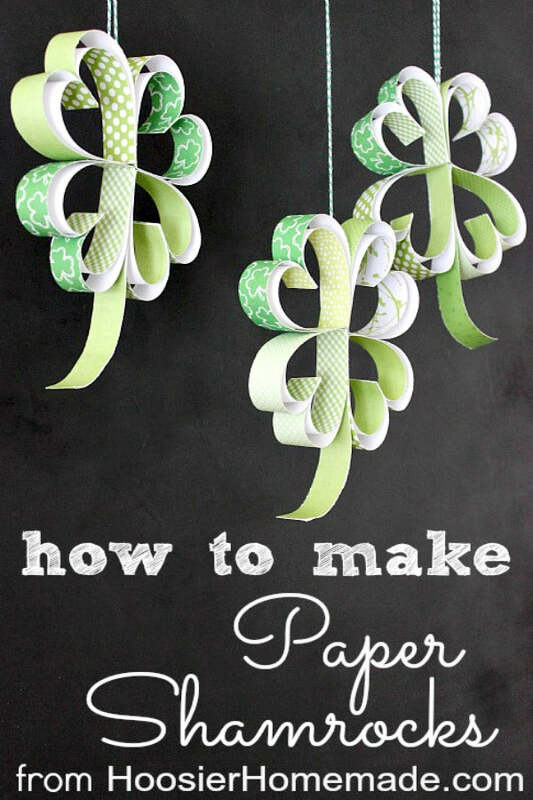 Make your own luck when you create these beautiful hanging shamrocks. You can hang these up in front of windows, from the ceiling, or make a long garland to drape from your staircase. 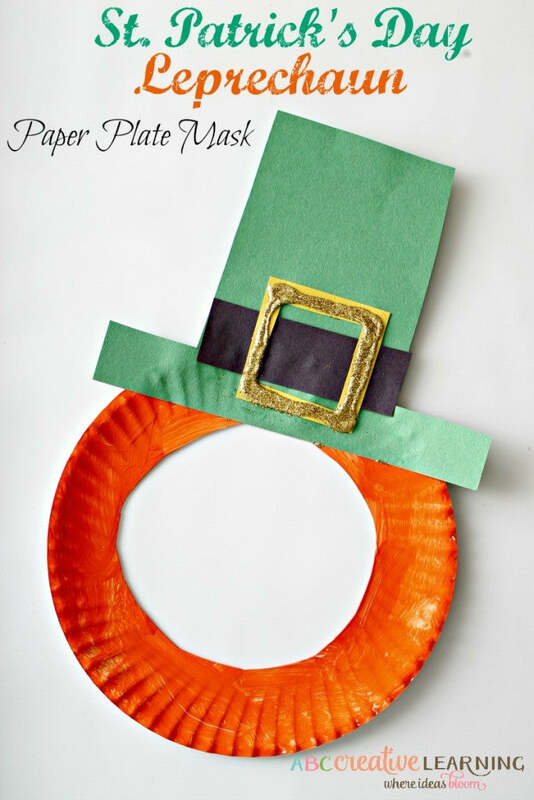 Just pick solid and patterned papers in either green, orange, or white (for the Irish flag), and get busy shaping these lucky decorations. These rainbow cookies are seriously beautiful. Their colors pop, the dough is sweet and tasty, and they fit in perfectly with the St. Patrick’s Day look. Serve them with milk for a refreshing dessert or with beer if you’re of-age. You can either present these on a platter, wrap them up with ribbon like they’ve done below, or package them in individual cellophane bags to sell or give out to loved ones. Set these beside another culinary craft like the pot of gold above and you’ll have one breathtaking dessert station for St. Patrick’s Day. We showed you one St. Patrick’s Day DIY costume above, but this is another type you can make with a paper plate and construction paper! This would be a fun thing to make if you’re having a St. Patrick’s Day party because you could make a few and set them out for a selfie photo booth. Either buy plates that are orange and cut them up to save time or get out some paint and customize what you have at home. These costumes are fun for adults and kids alike and will fill you with the lively spirit of the Irish. Bark candy is a very versatile thing you can make for most holidays. For Christmas, you can use mint and candy cane. For Valentine’s Day, you can use dark chocolate and raspberry truffle bits. 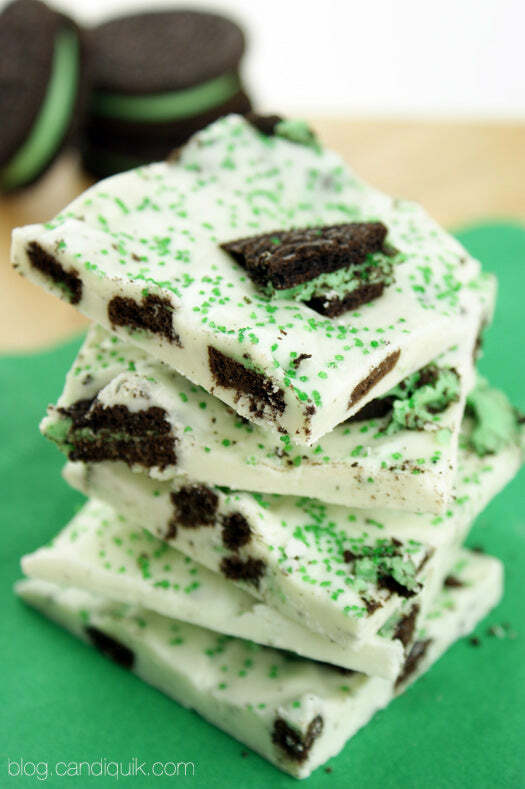 For St. Patrick’s Day, white chocolate, Oreos, and green sprinkles and green candy definitely do the trick. You can follow this recipe if you’re in need of a sweet St. Patrick’s Day themed treat or just something new to whip up in the kitchen. The great thing about this recipe is that you can break it up into big blocks or tiny, bite-sized pieces depending on the size of the leprechaun who’s eating them. Luck is something St. Patrick’s Day is known for. 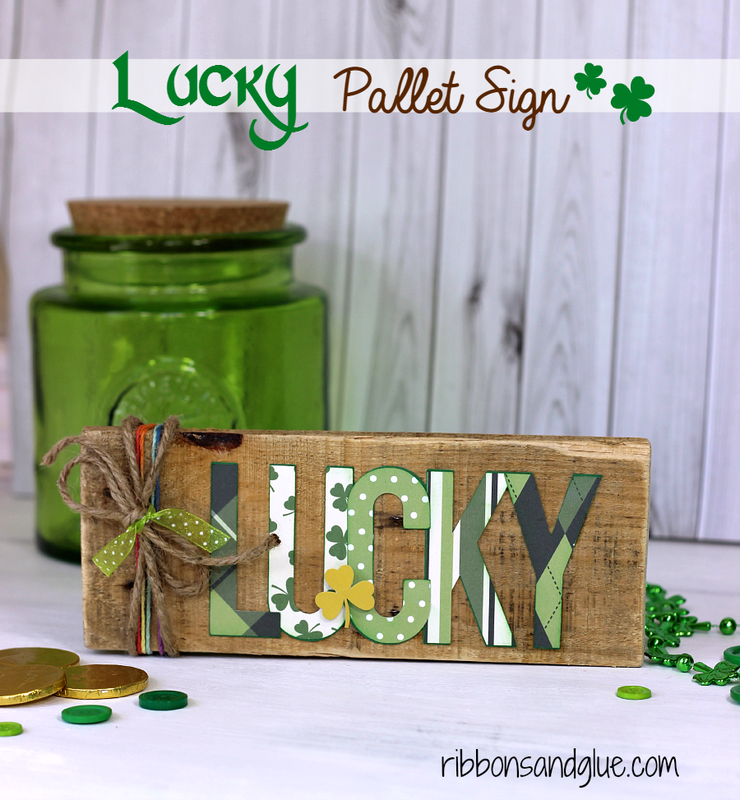 Remind yourself how lucky you are to be Irish or how lucky you are to be loved and living a great life by making this lucky green craft at home. It’s pretty customizable depending on your style and the materials are cheap, so go crazy with different patterns, ribbon, and paint, or make it simple with some glitter glue and a four leaf clover or two. 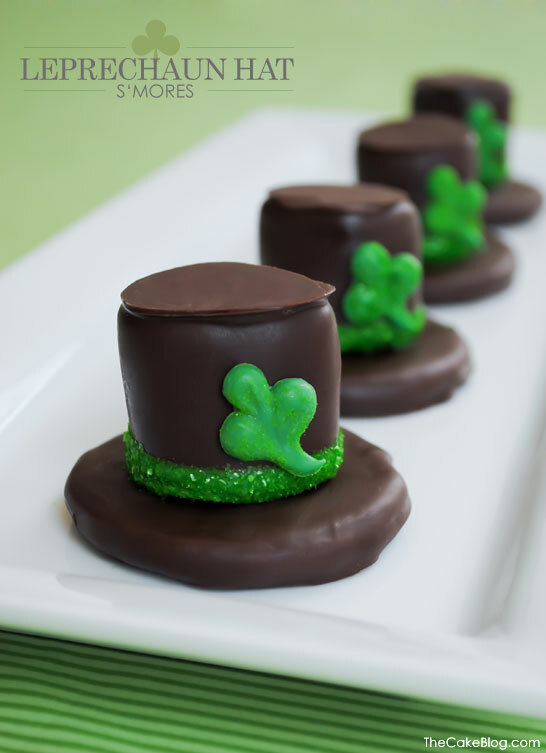 To “top it all off” (sorry, we can’t resist a good pun), we found edible leprechaun hats for you! These green little guys would be pleased to see these delectable and cute head toppers. With marshmallow and chocolate, they’re also pretty pleasing for cooks too since they don’t take too much time or effort to make. Since this is a sculptural baked good, have your kids help or invite friends over to enjoy Irish coffee while you assemble these treats. “Kiss me, I’m Irish” is a saying we’ve all heard. We just love how literal these Hershey’s Kisses took it! Pick out the kind that have green and silver wrappers and put them in a bowl. Then, make a quick sign or use a printable that says the famous saying and stick it to the bowl. Your guests will enjoy the clever play on words and of course, the delicious chocolate inside. So many fun ideas! Thanks for sharing our Shamrocks! You’re welcome Liz! Happy St. Paddy’s Day!